Music director Harry Christophers leads Friday night’s performance. 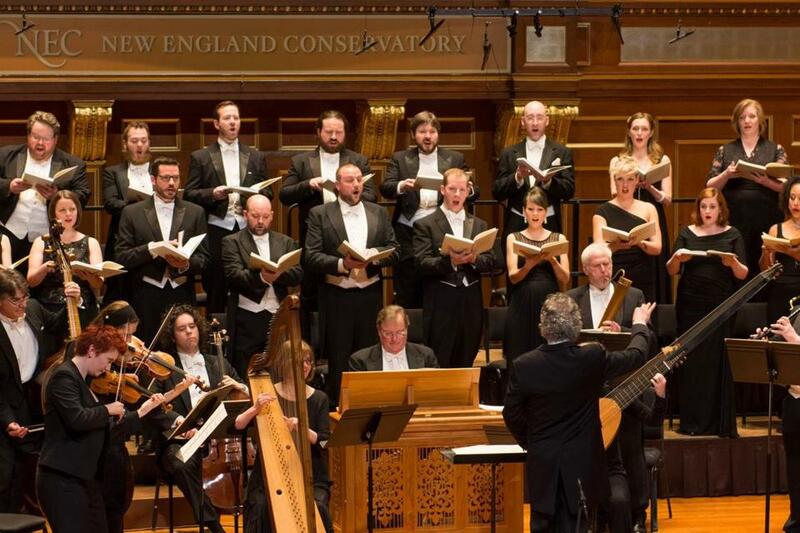 Experiencing the Handel and Haydn Society’s performance of Monteverdi’s Vespers of 1610 was like observing an exquisitely detailed large-scale tapestry. While the work includes many different colors, textures, and characters, it was clear that each scene was woven from the same threads. At the helm was music director Harry Christophers, whose recording of the work with the Sixteen also includes this weekend’s tenor soloists, Jeremy Budd and Mark Dobell. A solo tenor’s clarion call went forth from the stage of Jordan Hall, an animated silence overtook the room, and a shining expanse of sound suddenly materialized. While the small orchestra exalted in interlocking ascending phrases, the chorus declared the opening statement in sustained D major chords, organ-like in their magnitude and depth. Each sonic thread stood out with its weave palpable through the others, enabled by the hall’s marvelous acoustics. Vibrato was noticeable but not distracting or overdone, and voices never smeared. The foundation thus laid, each movement acted as a vignette. In the duets for two sopranos, the light and glimmering voice of Margot Rood perfectly complemented the dusky, rich tone of Sonja DuToit Tengblad, and both sang with sublime but unpretentious elegance. High voices are disparately spotlighted in this work, but baritone David McFerrin made his presence known, surging through melismas under gliding soprano lines. Dobell sang a handsome, luminous “Nigra sum,” accompanied by the delicately earthy chitarrone of Elizabeth Kenny. Jordan Hall’s acoustics weren’t the only advantage the space gave to the music. In “Audi coelum” (“Hear, o Heaven”), Budd put forth rapturous questions, with the answers literally ringing from above as Dobell echoed the final few syllables of each statement from the center of the balcony, making a different word — for example, “gaudio” (joy) became “audio” (I hear). The sides of the balcony held the Young Women’s Chamber Choir, which joined the sopranos of the chorus to create a flood of seraphic surround sound in the “Sonata” movement, punctuated by agile duets of violin and cornetto. For this flexibly orchestrated work, H&H brought out its arsenal of Renaissance instruments and players who know them like a first language. Textual cues were acknowledged in subtle, effective ways. In particular, every time the end of the “Gloria Patri” doxology appeared, the music seemed to receive an extra infusion of serene fire. And in the last section of the Magnificat, which had encompassed every mood and characteristic heard in the previous movements, the sweeping, soaring energy of the opening returned. As it was in the beginning was now.